This March brought the first major update to camera design since the dawn of cheap digital photography: a camera that lets you adjust the focus of an image after you’ve taken the picture. It is being sold for $399 and up by Lytro, a startup based in Silicon Valley that plans to use its technology to offer much more than the refocusing trick—options like making 3-D images at home. All consumer cameras create images using a flat plate—whether chemical film or a digital sensor—to record the position, color, and intensity of the light that comes through a lens. 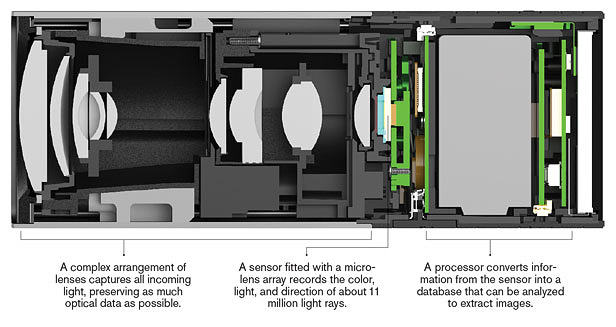 Lytro’s camera does all that, but it also records the angle at which rays of light arrive (see graphic). The resulting files aren’t images but mini-databases capturing the three-dimensional pattern of light, called a light field, at a particular moment. Software can mine that database to produce many different possible photos and visual effects from one press of the shutter. Lytro has wrapped its technology in a consumer-friendly package, making this new form of photography more likely to catch on. Light-field cameras existed before, but they had limited industrial uses and were never cheap enough for consumers. Lytro founder Ren Ng, who worked on light-field technology for his PhD at Stanford University, made this one affordable by simplifying the design. Instead of using multiple lenses, which made previous light-field cameras expensive and delicate, Ng showed that laying a low-cost plastic film patterned with tiny microlenses on top of a regular digital sensor could enable it to detect the direction of incoming light. Recording the entire light field entering the camera means that images can be focused after the fact: a user can choose near, far, or any focus in between. Refocusing images after they are shot is just the beginning of what Lytro’s cameras will be able to do. A downloadable software update will soon enable them to capture everything in a photo in sharp focus regardless of its distance from the lens, which is practically impossible with a conventional camera. Another update scheduled for this year will use the data in a Lytro snapshot to create a 3-D image. Ng is also exploring a video camera that could be focused after shots were taken, potentially giving home movies a much-needed boost in production values. That is going to require one very interesting video codec. I can see it now -- producers having to constantly say "get away from that butterfly -- we're over HERE!" 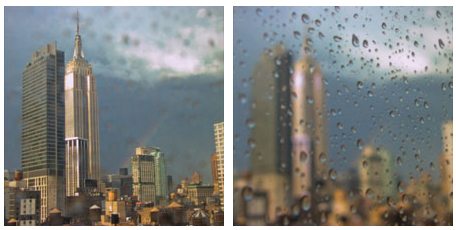 The nice thing about the Lytro technology is that it preserves color information. I'm curious if it offers, even remotely, the same type of precision as that which Leap Motion is extracting from a field of view. THEIR specifications include, within an eight cubic foot volume of "recognition space", a reproducible position detection precision of 0.01 millimeters (ten micrometers, one wavelength of longwavelength range infrared light) and a motion detection latency which is below the threshold for human detection. Using infrared LEDs to illuminate the field of view, their potentially quarter-sized sensor uses a lenseless technology to generate CCD imager data. Which consists of superpositioned diffraction pattern data, ~166 frames per second. Which links via USB 2.0 to an API which, while extracting potentially multiple billions of points, consumes approximately 5% of the CPU time of a nothing-to-write-home-about generic PC. Initial commercialization: a better "mouse" trap -- gestural detection/ recognition, just the TIP of the iceberg. Guaranteed: Disruptive Innovation of the Year, NEXT year. What a fascinating technology. I am excited by the possibilities for filmmakers and photographers, and I think this is one technology that will revolutionize photography. The most obvious application I think is a one-shot CT scan. Does Lytro technology has applications in astronomy telescopes? If yes, they should immediately get in touch with James Webb Space Telescope coming up. There are so many other Very Large Telescope (VLT) and even Overwhelmingly Large Telescopes (OWL) under construction. They all could possibly benefit from Lytro's optics.